When it comes to designing a bedroom, you want it to reflect your personality and have a unique edge to it. This is because it's your special place. It's where you can escape to, it's where you dream, and it's where you love. So taking the time out to ensure your room has everything that you need and want, is important if you want a beautiful boudoir. The most important thing is a good mattress and soft sheets. If you haven't got a comfortable mattress, you won't be having a nice enough sleep - and you should. Now as for the appearance, a sophisticated headboard can introduce something new. You could go for a bright colour, or a pretty pattern to focus the attention to the bed. Who doesn't want to enter a room that smells of fresh lilies and roses? Flowers are wonderful for adding pops of colour that can be scattered around the room, and not only do they look visually appealing, but they will have calming effects on you, plus, they purify the air and make sure that the humidity in the room balanced. An immediate thing you will notice, is the sensation of your bare feet touching the floor, so if it's hard and cold, it won't feel comforting, and you should feel that way when in a bedroom. So it's wise to invest in a luxury carpet, something soft and fluffy that you can get your toes right in between. If carpet isn't for you though, you could get a large rug instead that can fit under either side of your bed. Not only will it look professional, but it will be perfect when climbing in and out of bed. Lights are very important when trying to create an atmosphere. Arts and crafts lighting can come with intricate patterns on warm coloured glass shades, that are able to enhance the beauty of a room with their pretty designs and cleverly crafted metalwork. You could put a tall lamp on either side of the bed, or a chandelier in the centre to draw in the eye. The main feature is your bed, so you don't want to take away from that, but if you have a large space that needs filling, add a comfortable chair, somewhere that you can sit and read in the evening. If you have a big enough window in your bedroom, you could even build in a seating area underneath the window so you can look out and daydream when you need a timeout from the normal world. Coming up with a color scheme is key, because you will need to refer back to it when looking for items to add to the room, so you will want to coordinate the colours to showcase your personality and mood. 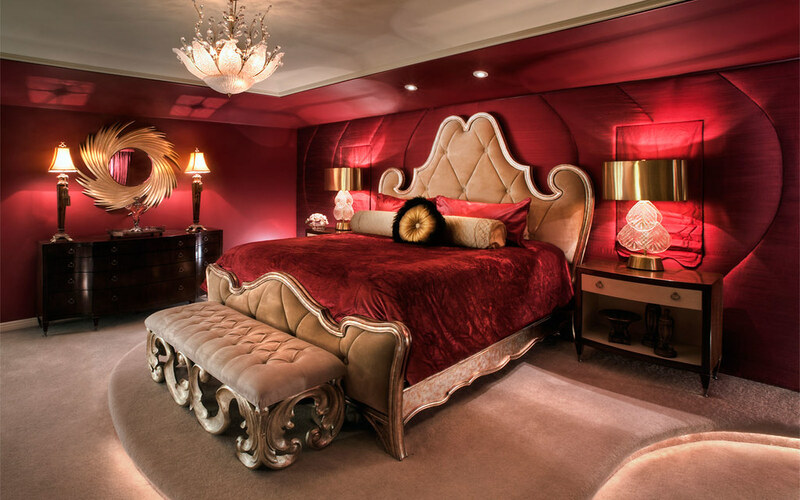 If you want your bedroom to be quite passionate and romantic, then deep reds are great for that. Or if you want to stay classic and elegant, very light colours work for this, paired with splashes of silver or gold.